Every two weeks the recycling trucks rumble through Grand Rapids, stopping at every residence that has a blue bin with a yellow lid set out front. A mechanical arm dumps the bin’s contents into the truck bed with a resounding crash and it clamours on. Recycling is free in Grand Rapids and is a practice many residents utilize. While in theory recycling is pretty easy, in practice it gets a little more complicated. At WMEAC, we encounter a lot of questions about recycling. Our partnerships with local businesses over the years have given us a wealth of information, and although we are not a recycling depository site, we know where most things go. So much of what’s in your home and car, including electronics and appliances, can be recycled, and we want to help direct you to the right place for all of your items. If you’ve ever had questions about recycling in Grand Rapids, well, here are some answers that may help you improve your recycling knowledge. The Recycling Center in Grand Rapids is a single stream recycling facility. No bags or separation is required of residents as long as the items are 75% clean. The facility also accepts drop-off recycling items such as television sets, laptops, and other electronics at 977 Wealthy Street (please see the site page for more information). Any other items that are thrown into residential recycling are removed and thrown directly into the trash. This puts the responsibility squarely on county residents to keep the wrong items out of this facility, and ultimately away from the landfill. The Kent County Recycling and Education Center (REC) accepts five item categories only: paper/cardboard, plastic, metal, glass, and cartons. These items can have up to 25% surface-area contamination of foods or other removable substances. The facility is a highly efficient sorting center, but it still encounters issues. The sorting machines stall most often when they encounter tanglers: items that get caught in the separating discs and magnets of the facility. Tanglers are things like loose bags, ropes, cords, hoses, and plastic bags that wrap around the discs and wheels on the sorting machines. This creates problems and can shut down an entire Materials Recovery Facilities (MRFs) or recycling plant that sorts recyclables. At the REC, tanglers mean that a facility worker will strap into a harness and climb into one of the machines during an unscheduled shutdown to pull out these tanglers by hand. Tanglers are often non-recyclables. However, some items that are recyclable, like plastic bags, have become a hazard because of the way they were recycled by residents. When we talk about “plastic bags”, we mean the kind customers receive at grocery stores at checkout stations. The best place to dispose of plastic grocery bags is the store they were received from. Many stores like Meijer and Family Fare have receptacles for plastic bags in their entrances. The second best option is to recycle your bags. If you plan to do this, stuff all your plastic grocery bags into another plastic bag, tie it shut with the handles, and place it into a residential recycling bin to avoid causing tanglers from loose bags in the bin. While REC accepts all hard plastics, with or without a recycling symbol, the center does not accept soft plastics. Some of the most common items we get asked about at WMEAC are things like styrofoam, batteries and light bulbs. These items have two things in common: they are not accepted at the REC, and they should not be recycled residentially. Each of these items are recyclable, but at different locations. We suggest taking these items to Dart Container in Byron Center or Kentwood. On the other hand, light bulbs and batteries can both be thrown into the garbage; neither are toxic enough to the warrant a specialized recycling facility. However, many people have these items stored in bulk to recycle, and several locations take them. Light bulbs can be dropped at a Home Depot or Lowes. Recycling batteries is a little bit more involved and depends on what type they are. Standard Alkaline batteries like AA, AAA, and other household batteries can be deposited at different locations around Grand Rapids, although some drop off locations require a deposit fee. The Energizer battery site also has a pretty good recycling center locator. Every battery can be recycled, from rechargeable batteries to car batteries and computer batteries, it just takes finding the right recycling center. Finally, we’ll wrangle with an age old question: why does an item have a recycling symbol on it if it is not accepted through curbside recycling? The answer is twofold: First, every recycling facility accepts different items because they all have varying facility standards, ages, locations, and myriad other reasons. Second, a recycling symbol can be pasted on anything that can be recycled at all, but that doesn’t mean an item is accepted at your local recycling center. So just because a granola bag has a chasing arrows sign does not always mean it can be recycled at your local location. If you’re not sure an item is recyclable you can search for an item on the Kent County Department of Public Works site, “Reimagine Trash.” The site has an interactive search engine that can tell a county resident exactly where to take an item. Recycling drops from our hands to our waste bins, from our bins to hauling trucks, and drops from hauling trucks into local facilities to be sorted. 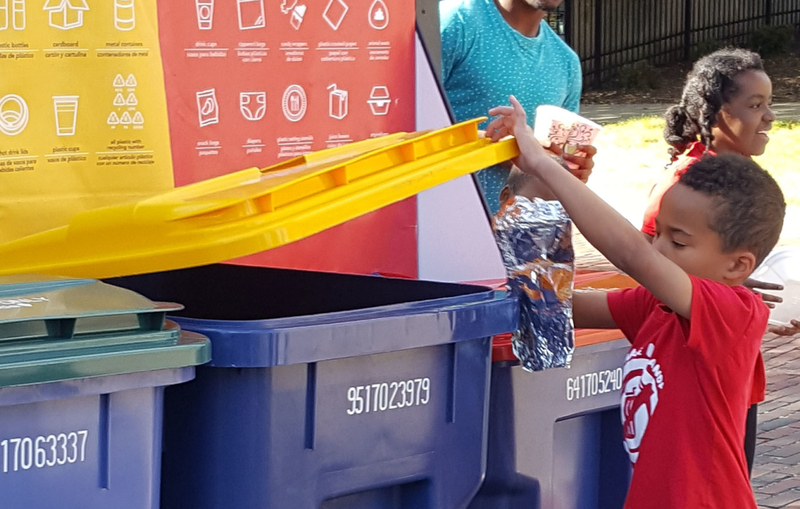 Recycling can seem complicated, but if a little research and thought is put into the practice, we can save the local recycling centers a lot of hassle and help make the process easier for everyone.